Thanksgiving desserts for everyone! 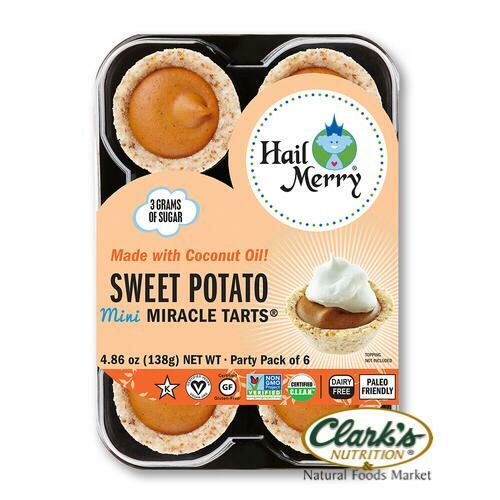 Hail Merry's Sweet Potato Mini Miracle Tarts are sure to be a hit at your Thanksgiving gathering. These decadent little tarts are made with coconut oil and simple ingredients. They're also paleo, gluten free, dairy free, vegan, non-GMO, kosher and perfectly portioned. Available in these tasty flavors and varieties: Sweet Potato, Meyer Lemon, Egg Nog, Chocolate Miracle, Chocolate Mint, Chocolate Almond and Coconut Vanilla Creme.